As you know I recently had a friend from Australia visit me here in the UK. She spent a few days in the area with her partner, but mostly came to spend time with me and the boys. We met when I was pregnant with KT and have been friends ever since – that’s coming on 10 years now. The last night of their stay, L and JJ came over for a home-made dinner. It was hard to know what to make, as I didn’t want to spend more time in the kitchen than necessary and they’d be gormandising in the south of France for 2 weeks before their Cookham fly-by and in traditional French tradition, we were starting with foie gras, brioche and homemade apero. I’m not used to meals that stretch out over hours, peppered with conversation and laughter with other adults. It felt luxurious. I hadn’t seen my friend in almost 4 years and yet it felt like no time at all had passed and it made me appreciate, heartily, the value of a good friend. An early start the next day and travel abroad for everyone including AT who was flying to Paris, made our feasting and frivolity feel reckless and somehow more urgent. After snacking on the tortured liver of one bird, we moved on to the succulent thigh meat of another with my chicken and vegetable pie paired with some green side dishes to add virtue to a thoroughly decadent meal. Asparagus and broccolini with lemon juice and olive oil, a simple cos lettuce salad smothered with a lovely Texan Ranch dressing, and the dish that I took a chance on and won; broad bean, goat cheese and pea-shoot salad. And in the morning it was all over. I was alone, a little bit lonely, and left to face a kitchen that looked like a bomb-site. I think I might have used every plate and glass and item of cutlery in the house. Bowls were piled high, and food lingered on plates still on the dining table. It was late, we’d been drinking and it was, after all, the last supper. Going from all to nothing so thoroughly and so quickly, left me feeling rather sad and lonesome the next day. But later that night, AT got home from his whirlwind Parisian business trip to greet me with a little box of jewels that were not of the wearing kind. 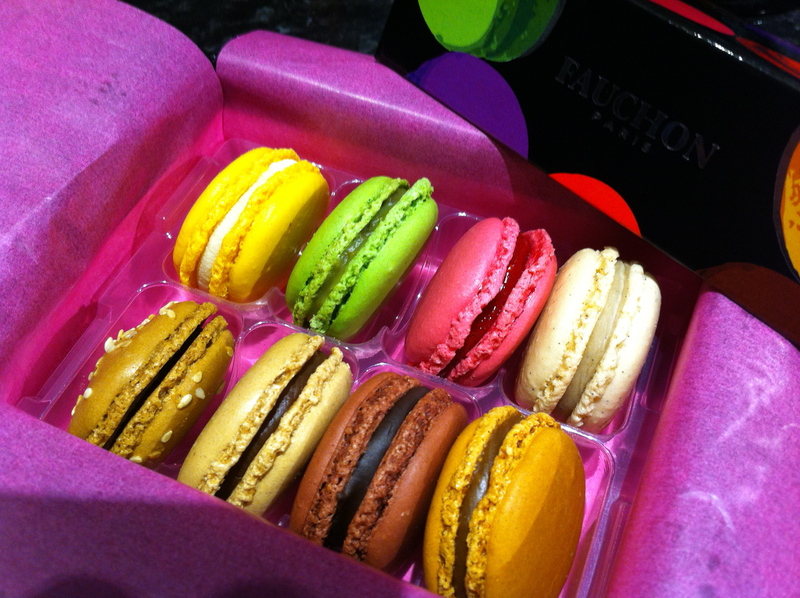 A black shiny box with pink paper inside revealed a selection of eight Fauchon macarons, fresh from Paris. The colour, crunch and perfection of each delicate morsel was just the thing to lift my spirits and remind me that even though I was alone momentarily, I was loved. So back to business. 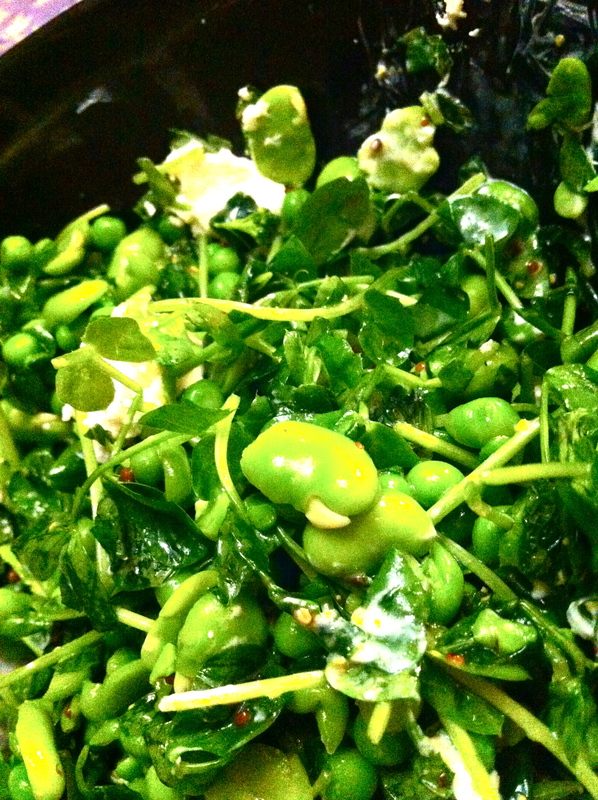 I found the recipe for my pea shoot salad, much to my amusement, on the pea-shoot website. I discovered that vegetables had their own websites when I was working at the newspaper…and they have some very decent recipes to boot – there’s a beetroot one, peas, asparagus….you get the idea. In a bowl, combine the peas and broad beans, smash up a good lot of them with a fork. This helps with the eating of the salad, those beans and peas can be slippery. 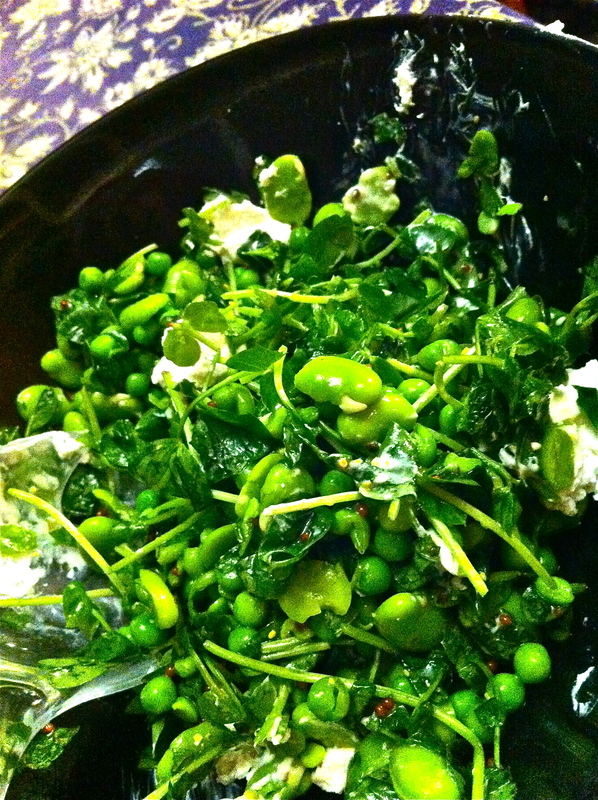 Add the pea shoots and mint along with some salt and pepper. Put the dressing ingredients into a jar and shake it up to emulsify. Dress the salad, mix to get good coverage and place pieces of cheese over the top of the salad.